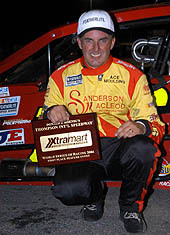 When we last left the NASCAR Modifieds at Thompson Speedway in October, Mike Stefanik was standing in victory lane, but unsure about what his open wheeled plans for 2005 would be. The Brady team is no stranger to winning either. Most recently, they captured the Speedweeks championship in February at New Smyrna Speedway (FL) with Christopher behind the wheel. At last year’s NASCAR banquet, Matt Hirschman was named as co-crew chief of the year when his father won the Modified Tour championship. The younger Hirschman was a part-time crew chief on the #48 car because of his own driving duties on the Race of Champions Modified Tour. Stefanik had been balancing his day job competing in the NASCAR Busch North Series with a limited schedule of racing the #16 Modified for Flamingo Motorsports, but when that team decided to expand their schedule for ’05, Stefanik was now looking for a ride. 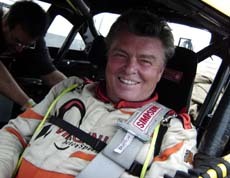 Meanwhile, the #00 Brady Bunch team was looking for a driver after rotating through racers like Bobby Santos, III, Steve Park, Eric Beers and even Ted Christopher during their 2004 efforts on and off the Tour. At some point this winter, both parties found each other and Stefanik has been named as the new driver of the #00 for a limited schedule of events this coming year. Stefanik’s record in Modifieds is nothing short of amazing. He has 66 career victories, which is 50% more than second place Reggie Ruggiero, since the Tour has organized in the 1980’s. 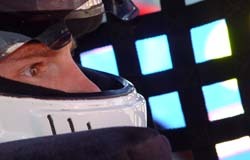 He also has six titles to his name, with tow (1997 and 1998) coming in years where he also doubled up and won Busch North titles in the same season. This year, Hirschman is doing more racing and less wrenching. But he still hopes to have a presence on the Tour with a new role. apple doesn’t fall far from the tree. His father is known for an amazing amount of consistency and Matt followed in those footsteps – although he might have traded that for a couple of wins. Hirschman hopes that winning will be more common in 2005 though. Tom Baldwin’s memory will live on in the form of a golf tournament planned on his native Long Island. The event is scheduled for June 9th at Bellport Country Club in Bellport, New York. Several high profile members of the racing community have already pledged their support for the event. Already committed to the Tom Baldwin Memorial Open are NASCAR Nextel Cup drivers Tony Stewart, Kasey Kahne, Rusty Wallace, Michael Waltrip, Steve Park and Jimmy Spencer. Also appearing will be Tom’s son and crew chief of Kahne’s #9 car, Tommy Baldwin, Jr.
Money raised at the event will be distributed to Village of Bellport Concert Series, Victory Junction Gang Camp, Susan G. Koman Breast Cancer Foundation, and the Autism Society of America. Money will also be raised through a silent auction. New Jersey is on the Southern edge of where most NASCAR Whelen Modified Tour teams are based (with the notable exception of Eddie Flemke’s #79 Hillbilly Racing team, which calls North Carolina home), so it’s no big surprise that two Garden State competitors are planning to enter some of the NASCAR Southern Modified Tour events this year. Speed51.com has learned that 1990 Tour champion Jamie Tomaino will enter the Southern Mod opener on March 26th at Caraway Speedway (NC). Brian Crammer will also run some southern shows this year and has switching numbers from #56 to #89 for his entries in both NASCAR Modified divisions.